The Dupray Hill Injection Steam Cleaner is the most powerful portable commercial steam cleaner there is. Hand built in Italy, the Dupray Hill Injection Steam Cleaner eliminates grease, grime, dirt, soil build up and bacteria from a number of surfaces without the use of chemicals, and with unmatched efficiency. What's more, this amazing machine is fully portable so you can take the power of steam with you, no matter where you go! The Dupray Hill Injection Steam Cleaner is a fully commercial-grade steam cleaner, designed for the professional user in mind. The small 1.5-liter, full stainless steel boiler allows for superior heating -this steamer is ready to use in just minutes. This allows the Dupray Hill Injection Steam Cleaner, even with it's heavy-duty components, to weigh just 23 pounds, making it lightweight and mobile. With an unrivaled 121psi of steam pressure, the Dupray Hill Injection Steam Cleaner is ideal for the professional auto detailer. The high level of steam will dislodge the hardest to remove stubborn residues including: brake dust, carbon, engine oil, grease, salt stains, diesel smoke and fuel -without the use of chemicals. Because the pressure is adjustable, the Dupray Hill Injection Steam Cleaner works wonderfully on interior surfaces such as leather, vinyl, soft-touch, plastic and more. Not only does the Dupray Hill Injection Steam Cleaner offer exceptional temperatures and high levels of pressure, it features a continuous continuous refill system. Unlike traditional steamers, which must cool before water can be added, the Hill Injection Steam Cleaner can be filled while in use. There is no downtime. The boiler itself is made of TIG-welded stainless steel for superior quality. An electromagnetic float cleans scale, calcium and mineral build up as you use it, allowing you to use regular tap water. Dry Steam. One of the Dupray Hill Injection Steam Cleaner's biggest benefits is it's low humidity steam � only 5% water by volume. Not only does the steam powerfully clean surfaces without the use of chemicals, it leaves them near dry. This significantly reduces dry time and eliminates the chance of mold and mildew build up. For the times when you need a blast of superheated water, this steamer features an ingenious Unique Boiling Water Injection system. Now you can rinse away solutions and clean with a blast of sanitizing water. Each Dupray Hill Injection Steam Cleaner comes with 26 Tecnovap Accessories. These industrial-grade accessories are built in Italy, not China, and designed to compliment the Hill Injection's impressive performance. 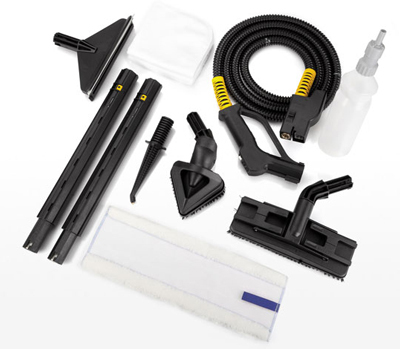 A variety of brushes, wands, sprayers and more are included. With a continuous refill, powerful (and adjustable) steam, and superior build quality, you would think the Dupray Hill Injection Steam Cleaner couldn't get better. It does. Because the refill system allows for a small 1.5-liter tank, the Hill Super Inox is fully portable. This light weight, portable unit is the most powerful portable steam cleaner available. Put the power of steam in your hands with Dupray! Expedited and International shipping are not available. Additional discounts are not applicable on this item. This item is non-returnable.